The paper deals with an iterative treatment of solving the nonlinear satellite-fixed geodetic boundary-value problem (NSFGBVP). To that goal we formulate the NSFGBVP consisting of the Laplace equation in 3D bounded domain outside the Earth. 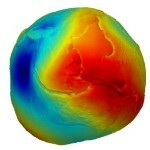 The computational domain is bounded by the approximation of the Earth's surface where the nonlinear boundary condition (BC) with prescribed magnitude of the gravity vector is given and by a spherical boundary placed approximately at the altitude of chosen satellite mission on which the Dirichlet BC for disturbing potential obtained from the satellite only geopotential model is applied. In case of local gravity field modelling, we add another four side boundaries where the Dirichlet BC is prescribed as well. The concept of our iterative approach is based on determining the direction of actual gravity vector together with the value of the disturbing potential. Such an iterative approach leads to the first iteration where the classical fixed gravimetric boundary-value problem with the oblique derivative BC is solved and the last iteration represents the approximation of the actual disturbing potential and the direction of gravity vector. As a numerical method for our approach, the finite volume method has been implemented. The practical numerical experiments deal with the local and global gravity field modelling. In case of local gravity field modelling, namely in the domain above Slovakia, the disturbing potential as a direct numerical result is transformed to the quasigeoidal heights and tested by the GPS-levelling. Results show an improvement in the standard deviation for subsequent iterations in solving NSFGBVP as well as the convergence to EGM2008. The differences between the last and the first iteration, which represent the numerically obtained linearization error, reach up to 10 cm. In case of global gravity field modelling, our solution is compared with the disturbing potential generated from EGM2008. The obtained numerical results show that the error of the linearization can exceed several centimeters, mainly in high mountainous areas (e.g. in Himalaya region they reach 20 cm) as well as in areas along the ocean trenches (varying from -2.5 cm to 2.5 cm).